Directed by Doug Liman; far too many producers to list. 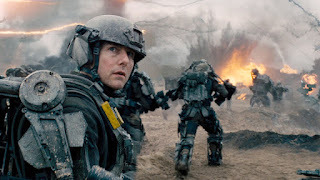 One of several science fiction films Tom Cruise completed in the last decade, Edge of Tomorrow is the story of an alien invasion, and one man’s attempts to defeat it. Cruise plays a publicist commissioned into the U.S. military to provide information to the public on the latest technological inventions that, it is hoped, will win the war against the enemy. Arriving at the London headquarters of the allied forces, he is told that he will be accompanying the next day’s invasion of alien-held Europe. This does not sit well with Cruise, who is, frankly, a coward. He tries to run but is captured and sent, as a private soldier labelled a deserter, to a combat unit. The next day, he is part of the invasion force, and is swiftly killed. He immediately wakes up the day before, and lives that day over again. Predictably, his bewildered attempts to explain that he somehow has already experienced the day fall on incredulous ears, and, once more, he is killed in battle. This happens repeatedly, and each time, Cruise learns more about the enemy, and about himself. Will it eventually be enough to beat the aliens? Though the premise is reminiscent of the comedy Ground Hog Day (1993), it occurred to me that Edge of Tomorrow’s spiritual progenitor is, in fact, a 1908 British Army textbook. I kid you not. The Defence of Duffer’s Drift is a book meant to teach small-unit tactics to junior officers, but in an entertaining, as well as informative, fashion. Written by Ernest (later Sir Ernest) Swinton, Duffer’s Drift describes a young lieutenant’s recurring dream: he must hold a position against attacking Boers in the recently concluded South African War. In the first dream, the officer is quickly overwhelmed. But he recalls the earlier dream in the second, and profits from the experience. Each dream provides him with more lessons, until he eventually learns enough to win. 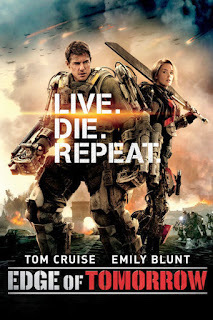 Unlike Duffer’s Drift, Edge of Tomorrow's hero is not dreaming, and unlike Ground Hog Day, an explanation for events is offered. The explanation is significant in fighting the extraterrestrials and, in fact, is used by both the humans and aliens in a see-saw battle of tactics, as one side utilizes information and misinformation based on what the other knows about the repetitions. 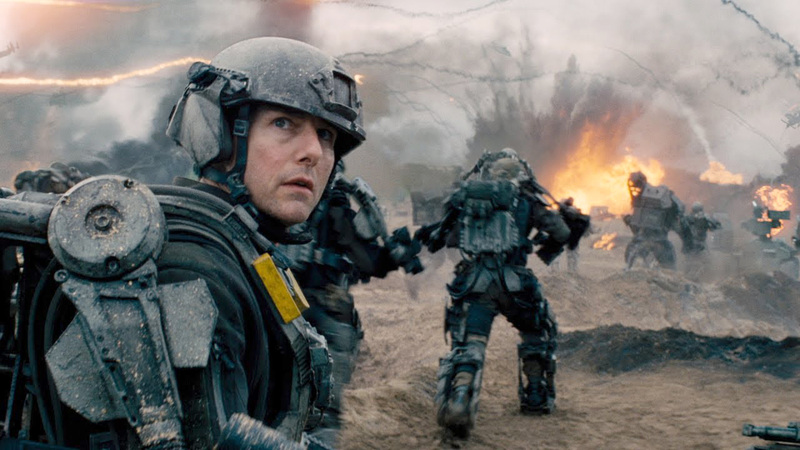 Unlike the simple shooting-gallery action of a film such as Aliens, there is science in Edge of Tomorrow’s fiction. That science may be questioned at the film’s conclusion; the finale is a puzzler that viewers must think about and, because of this, may be interpreted any number of ways, from simple to complex. It may even be dismissed as nonsensical. For myself, whether an ending that requires deep thought is preferable to one on which a brain can ride through on neutral, depends upon the story. And Edge of Tomorrow’s plot is comfortably complex. There is plenty of action, from expansive, well-staged, computer-created battle scenes to more claustrophobic confrontations in flooded tunnels and burning aircraft. Many of the scenes are repeated, as must be with such a story-line, but an element changes in each one, making it different and, as the movie progresses, setting the stage for following scenes. 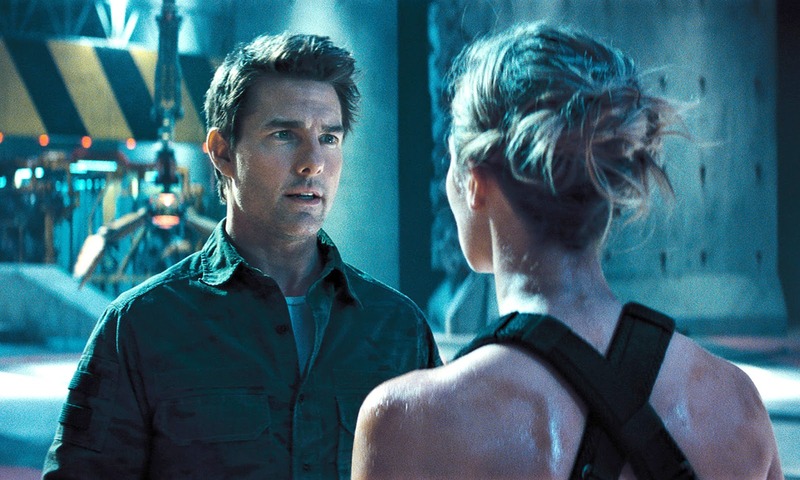 An opinion of any movie starring Tom Cruise, however, seems often to depend largely on one’s opinion of Cruise himself. Many find him off-putting; many think his acting feeble. I find that, though he frequently plays a similar character in all his films, various aspects of that character are accentuated to create contrasting personalities. Here, his character progresses from coward to hero but, by the time he attains the latter status, he has fought so long and so much that he is a very tired hero. There is an image, shown at a point at which Cruise has probably re-lived his day hundreds of times, that shows his utter fatigue and desperation. It is a telling scene, and is typical of Cruise when he’s good; subdued, without showing off. There is also humour in the film, usually at Cruise’s expense. 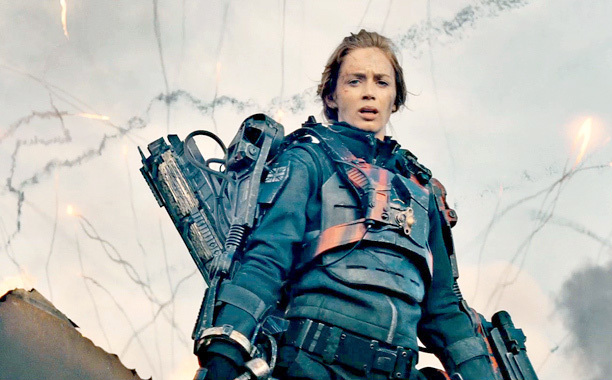 His interaction with co-star Emily Blunt, whose character is pivotal to the plan to defeat the aliens, is successful. In her reactions to him, we best see Cruise’s evolution as a character. And, despite a kiss they share, it’s clear that it is as friends and comrades that they come to respect each other. The other actors are adequate, though most parts could have been filled by any competent player. 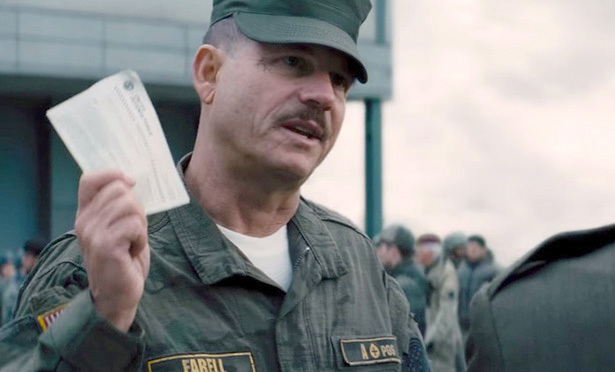 Bill Paxton is enjoyable in one of his last movie roles. While I am not a consistent fan of Tom Cruise, he is an actor who usually knows how to market himself and to choose his roles successfully. In Edge of Tomorrow, the plot nearly upstages him, which makes it a good science fiction film to see, even if you don’t really care for the leading man. Cruise is an odd case. Everything I've seen of him in "real life" is like something from a sci-fi horror film in itself, but in the one movie I've seen of his ("Rain Man,") I thought he was surprisingly charming. He must be a better actor than most give him credit for. I've never heard of this movie, but it sounds like fun. I'll check it out this weekend for my "Movie Night at the Dump of a Suburban Tract House." Cruise's personal life turns many off his movies but, ignoring that aspect, a number of his performances are very good. "Rain Man" and "Jerry Maguire" are examples. If you want to see him in another, quite different, science fiction film, check out "Oblivion". I liked that principally for the plot, which kept me guessing as to where it was headed. really good except the final act. the entire france scene seemed rushed and slapped on.